A wheel that is too small makes it hard to create nice lines (to keep arms and legs straight). A wheel that is too big, you will either not be able to spin with.. Unlimited possibilities with LED Simple Wheel Version 2! We have been manufacturing and testing LED wheels since 2014 and selling them for over 3 years with great success.High reliability, a really cool system which e..
A RGB LEDs strip is integrated into the inside face of the wheel which allows you to light it up any color, including white. The programming of the light patterns require some specific skills that you can easily learn with our video tutorial and the free software that we provide. Different software allows emulating a lighting console from your PC. We provide you a USB transmitter that will control the wheel -- you can choose to provide data to the transmitter using a Console or your laptop with a program. We provide one software with the wheel. Software is free but has some limitations that are usually not an issue for most performers. If you ever need to remove limitations you'll need to purchase an upgrade from the software company. Can be controlled LED by LED in pre-defined pattern mode. Can be controlled 4 LEDs by 4 LEDs in full video mapping mode. Only USB Transmitter, no more console needed. We have been making Cyr Wheels/Simple Wheels nonstop since longer than any serious manufacturer at the moment. We know what works on the long term and what does not. We have tested our LED Wheels and are producing them since 2014. We make reliable products -- don't waste your money buying someone's prototype. The electronics on our wheels is separate from the structure and each pieces of the wheel can be replaced, and each piece of the electronics also. Easy to replace LED strips in case of problems. 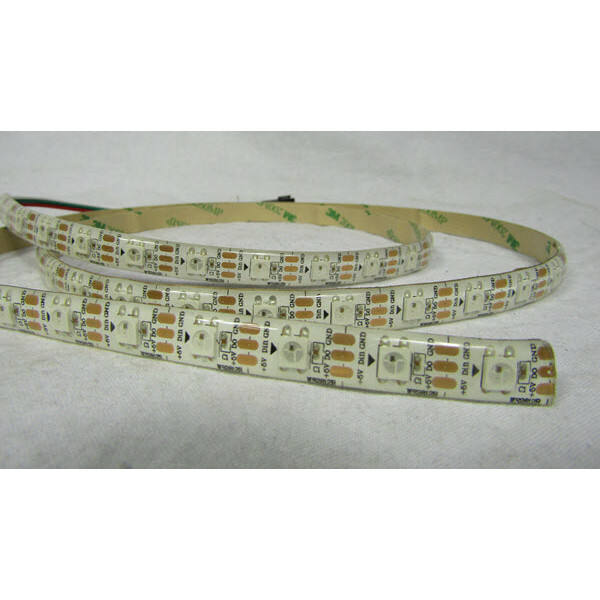 You can buy the LED strips with the connector from us, and install it yourself anytime very quickly. Wheel also comes with a spare LED Strip and spare Battery. Most important - your investing on a final product that will last if you care about it. We offer a one year warranty on the wheel and it's products for manufacture defects. Battteries at the moment take 5 hours to full charge( most of the time less since you probably won't use much the battery ). THere is one battery per wheel section so 5 batteries per wheel. We recommend that you purchase a spare W-DMX Controller because if the current one breaks, you cannot use your LED lights until you have another W-DMX Controller from us. Add an extra one in the options below! WARNING: The use of a LED Wheel requires basic to advanced computer knowledge and understanding of principles. Using and programming the wheel will require the client to learn the use of specialised softwares. The wheel comes with pre-programmed patterns in this software that are easy to use, once knowledge of the functionnality of the wheel is acquired. In simple terms: You'll need to play around with the softwares and devices 2-3 days before you can get good results to program your wheel. You also have to be aware that to do technical maintenance of your wheel, it requires you to open the wheel to inspect electronic components. We have made change of basic components very easy, but it still requires manual handwork. -"live" control of each LED on the wheel from a Distance using DMX frequencies. -send cue to cue light sequences programmed for the act. Allows being flexible on the act's timing while using complex lighting effects. battery life @ standby: abouit 40 hours. Comes with the DMX Transmitter compatible with the wheel. This transmitter can be plugged to a DMX console or a personnal computer. Official range is 500m but since the anternna is inside the wheel we recommend 100m max. If you take 5 chargers, you will charge all sections at the same time, so total charging time will be average 60 minutes, but up to 3 hours if battery is completely empty. If every you W-DMX Controller would be broken or lost, you would not be able to control your wheel. The DMX Controller that comes with your wheel is very specific, so it cannot be sources anywhere. We recommend that you get an extra one to avoid this eventuality. Contact us for latest videos and any information! Example #2 - Complete LED Wheel act with Lights Synced with Music by Hugo Noel. This is the result of only 2 days of pgramming using pre-programmed patterns and small tweaks that are easy to do. Q: Can I control more than one wheel with one USB Transmitter? A: Yes. In 2 different ways. Either you will send all the same cues of full Video Mapping to all wheels, or you can send different cues to different wheels, but only using pre-programmed pattern in Wheel's memory. Q: Can you do a wave like pattern ? A: Yes. You can do even any video mapping motion wanted. There are also many technical reasons for this. Also, the main ‘problem’ with LED’s on the side is that LED strips do NOT bend sideways.... this means very expensive, time consuming parts that are hard to replace and have to be made custom for any wheel size.. meaning you could not really order replacement parts. Helpful Video Tutorial : Basic Set-up LED Cyr Wheels --------> Click Here! ONE section for a simple wheel, as a replacement for a lost/broken part of you wheel It is on..
ONE joint, as a replacement for a lost/broken part of you wheel It is only the JOINT, that is..